There’s no reason to pay hundreds of dollars for a program to create .pdf files. I’ve been using and recommending PrimoPDF for at least six years. 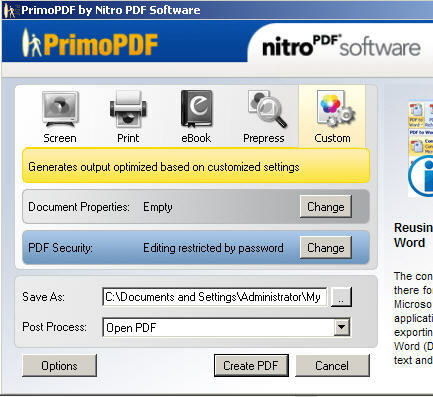 PrimoPDF is a reliable and FREE program which allows you to print anything to .pdf. Download from the site, install and when you select Print from any program – you will see that PrimoPDF is now an option you can select to print to. From this box, you select the button with the “..” on it, select which folder you want the finished .pdf to go, name your .pdf and click Create PDF. PrimoPDF takes it from there. This entry was posted in Andrea C on November 30, 2009 by Andrea.